On Twitter, don't underestimate the power of one-on-one customer support to win praise for your brand. That was a point driven home by keynote speaker Brian Fanzo, CEO of iSocialFanz, at the Social Shake-Up in Atlanta, who gave Delta Air Lines a shout-out during his presentation for its customer service efforts on Twitter. 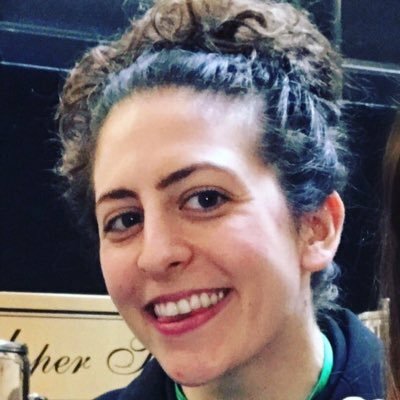 In a statement to PR News, Delta's general manager of social media Mallory Schroth told us that the customer service team behind @Delta on Twitter and Facebook is "empowered to take action using tools that equip them to assist quickly." But the airline didn't always have a full customer support team on social. "Delta began offering social media support in 2009 with just one representative responding to customers," Schroth continued. Through social listening, Delta discovered that many customers wanted their issues addressed on Twitter rather than over phone or email. The social team has since expanded, Schroth added; it now offers "24/7 support and [is] located in several cities with all of our digital engagement specialists receiving the same training and access to the same tools as those responding to customers on the phone." 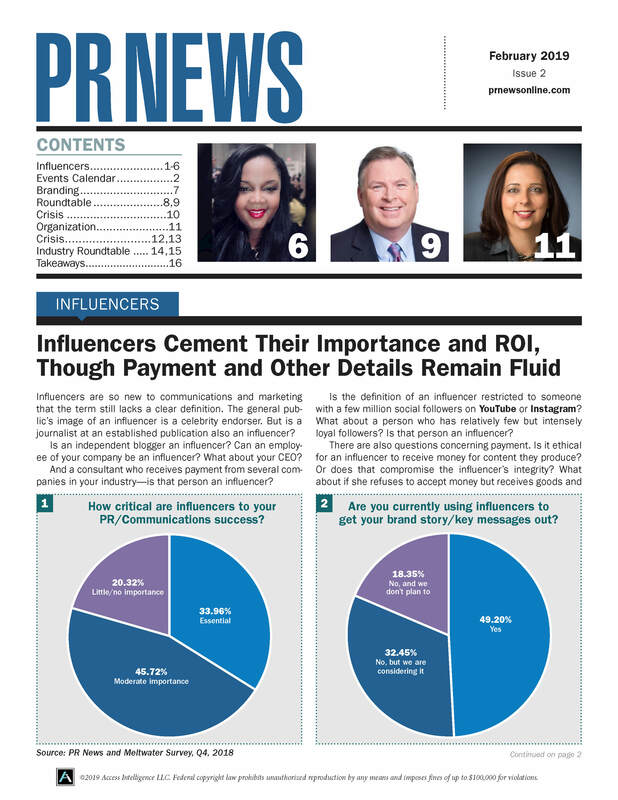 To aid other brand communicators seeking to upgrade their one-on-one efforts on Twitter, Fanzo and PR News took a look at five of Delta's Twitter customer support tactics. Each customer tweet is immediately acknowledged. Regardless of how much time it takes to fully resolve an issue reported by a customer (which varies by industry), the key, according to Fanzo, is making sure to acknowledge each individual as soon as they tweet. "Sometimes Delta says they are really busy, but will get to me ASAP. That’s way better than ignoring me until they have time," says Fanzo. Responses are handled on the same channel on which they're received. Fanzo likes that Delta's customer support reps respond on the same channel where they're initially contacted. He points out that Delta escalates public tweets to a direct message (DM) format rather than email or a phone call. "Sometimes a call is required," says Fanzo, "but it shouldn't be the first move." There's more than one way to say, "Sorry for the inconvenience." When responding to a customer complaint, Delta's individual reps respond in a unique manner acknowledging the severity of the issue. The last few days of @Delta activity showed several unique variants of the airline taking responsibility and validating customers' frustrations, from "I regret that we've dropped the ball," to "It appears we fell short and did not meet expectations." Customer information is kept track of throughout each social interaction. 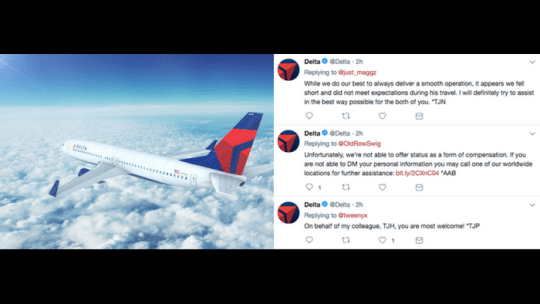 Once a customer interacts on social with Delta, they don't need to go through the repetitive process of typing their information a second time. "They never ask again for my name or SkyMiles number because they already asked via Twitter DM," Fanzo says. A human signs every tweet. Delta reps sign each tweeted response with an asterisk followed by three initials, letting customers know their request is being handled by a human and not an automated response. The variation of initials speaks to the number of staff (i.e., breadth of resources) Delta has deployed just for this purpose.